Former Attorney General Eric Holder is friends with the Obamas, but for some reason he decided to uproot former first lady Michelle Obama's famous mantra, "When they go low, we go high," at a campaign event on Wednesday. Holder amended Obama's statement a bit to suggest, "When they go low, we kick 'em." The crowd cheered and started chanting, "fight! fight! fight!" This, he added, is the "new" Democratic Party. Not so fast, Mrs. Obama said during an interview with NBC's "TODAY" Thursday morning. When asked by Savannah Guthrie about Holder's attempt to change her famous saying, she gave the anchor what I interpreted to be an annoyed smirk and stood by her original motto. "Fear is not a proper motivator," she said. "Hope wins out." Mrs. Obama challenged Americans to think of how they want to raise their kids. "Do you want them afraid of their neighbors?" she asked. How about "vengeful?" No, and she "absolutely" stands by her mantra. In the same week Holder encouraged his fellow Democrats to show no mercy to their political opponents, former presidential candidate Hillary Clinton told CNN that they should not be civil to Republicans until after they've reclaimed power in Congress. 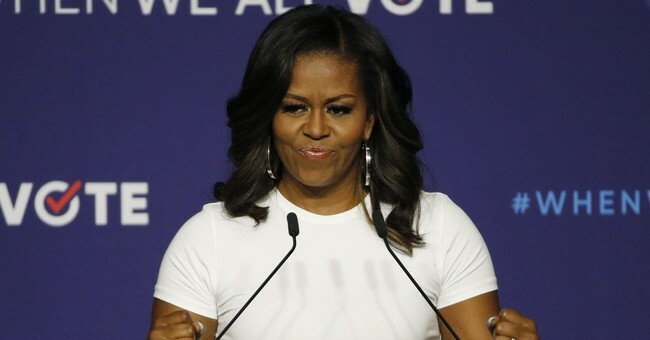 Mrs. Obama, meanwhile, is showing her willingness to reach out to Republicans. She spoke highly of her "partner in crime," former President George W. Bush, for instance. She was eager to explain that viral moment she shared with Bush at Sen. John McCain's funeral last month. The two also shared a sweet hug at the grand opening of the National Museum of African American History and Culture in 2016.